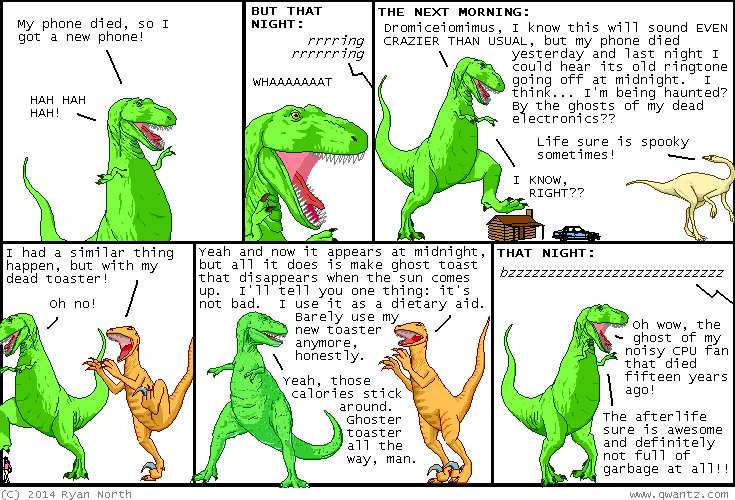 Dinosaur Comics - July 3rd, 2014 - awesome fun times! –She trips to the storied landmass of AUSTRALASIA! July 3rd, 2014: This comic, LIKE the previous one, doesn't accidentally use two similar-sounding words in different senses either! This new streak is going the distance, baby!! One year ago today: DON'T say you have a good sense of humour because why would you even say that? Say you have a GREAT sense of humour or just own it: "I have an average sense of humour. My jokes are okay, and you are liable to laugh a portion of the time."